The past few months things were very stressful for me. I’ve gone through so many stages of stresses in life, but this one is a whole new level. In fact I hadn’t even realised that I was so stressed that I was slowly falling into depression. 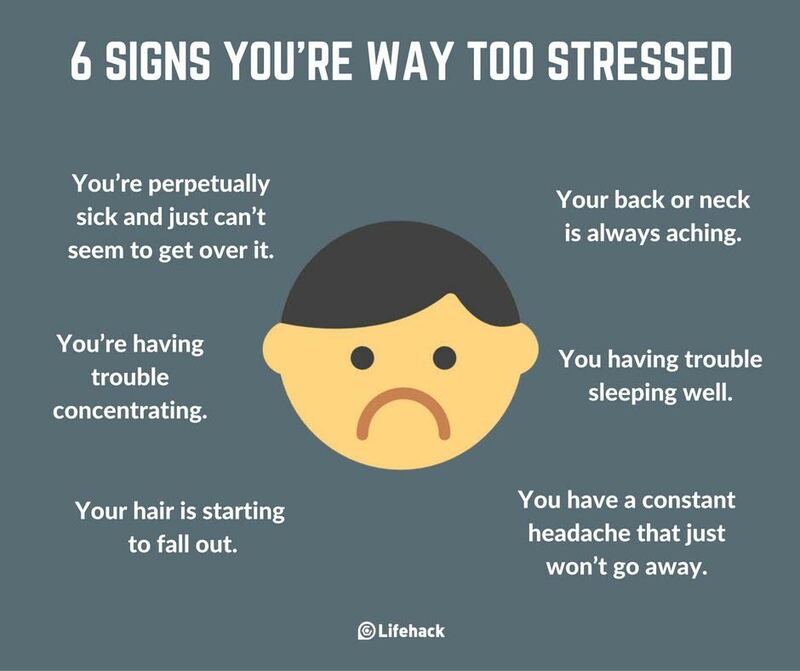 I think many people (myself included) tend to underestimate how stress can affect our mind and body. Recently someone shared with me the image below and guess what?, I went through all the 6 signs. First, my sinus and allergies went to from bad to worse. Then, I had constant headaches that doesn’t seem to go away and I could hardly sleep at night. My brain seem to refuse to stop working since I was constantly worried. My shoulder and neck were always stiff, and when faced with all the above, I had trouble focusing. I cut my hair short to help alleviate the ‘heavy head’ feeling, but it didn’t work. It still felt like as if my hair was still long. Sigh. I think one of the biggest mistake I made was that I kept my problem to myself. During the early stages, I didn’t discuss it with anyone, not even to CheeseBoy. Normally when I came back from the office, I will have dinner and went straight to bed and the same cycle repeat itself for about couple of months. I don’t really feel like going out over the weekend or meeting other people, even my family members. I’d rather stay home and sleep. I was also constantly hungry and my food cravings were insatiable. I guess my disappearance from this blog was also partially due to my stress and depression. Nonetheless, I am glad to inform you, our dear readers, that I am on my road to recovery. 2) Face your fears. Never avoid your problems. Yes, you can create a distraction, but the problem will eventually return to you. The sooner you face your fear the better. 3) Don’t take your loved ones for granted. During my difficult time, I avoided meeting people, even my family members. I did that because I knew I can lose my temper easily and I don’t want to be rude to anyone. The intention was good, but it was still wrong of me to do that. Don’t ignore the people who care for you. Don’t push them away. It is always easy to let out your anger to people who cares for you. But don’t push them away, as someday you might lose them forever. 4) Seek for help. In Malaysia, whenever you mention the word therapist/psychologist, it means that you are nuts. But that is totally a wrong concept. Sometimes it is difficult for us to talk to people close to us because we know there are emotional attachments and biases. Sometimes talking to a professional who’s not associated with you can be very helpful. 5) Return to “HIM”. If before I tend to skip my mengaji classes, I made sure now that I don’t miss my classes and make an effort to arrange for replacement if I missed them. I revise the Quran on constant basis, ensure my recital is correct, and I also started to learn the meaning of those Arabic words that I recite. Allah is the best helper. HE never forgets you even when you forget him. Seek for His favour as there’s none greater than Him. It is not easy for me to write this as it opens back old wounds. But I hope my sharing of experience could be helpful to others out there. Cheer up, there’s always a brand new day.